Life and Dandelions: So ... I'm getting married soon! So ... I'm getting married soon! It has been a crazy, busy year and I cannot believe it is almost September. The month of September is a special month for us ... we are going to be married. We won't be having a big ceremony with lots of guests, instead we will be having a BIG holiday with a little wedding thrown in. In approximately four and a half weeks we will be boarding a plane to Rome where we will spend five days checking out the sights and having some marriage paperwork made legal. We then fly to Sicily for seven nights. M's parents were born in Sicily, so it is a special place to spend some time looking around as he has never been there before. After Sicily we fly to Naples and drive to Praiano, a little town on the Amalfi Coast, approximately fifteen minutes from Positano. While we are staying in Praiano for seven nights we are going to get married!! On the day we will visit the little town hall to attend a civil ceremony, witnessed by two close friends who just happen to be travelling through the area at the same time. After the ceremony we will be heading to Il Pino for dinner. Two days later we head to Venice for three days, our last three days in Italy. We then hire a car to drive to Paris, stopping in Germany for a night or two while we stay with one of my closest friends who now lives there. We have five days in Paris then fly to Dubai for two nights to catch our breath before we fly back to Brisbane as an old married couple. It sounds absolutely amazing...and perfect in every way!! I hope you and your husband-to-be enjoy every second of it!! Paris, Dubai, Venice, the Amalfi Coast. Just perfectly romantic. Congratulations! Sounds like a perfect wedding - all about you two and doing stuff you love together. Have a wonderful time! How wonderful! Enjoy every special moment! FABULOUS! Can't believe it's almost finally here. Now that's MY kind of wedding! Congratulations. Have a wonderful time. The itinerary sounds DIVINE. I have tears in my eyes reading it, imagining what a perfect holiday and perfect way to get married it will be. Perfect indeed! I have the most fondest memories of Massa Lubrense, just outside of Positano - one of the world's most beautiful places... And Sicily is another favourite past travel haunt, so I am 100% jealous of this most fabulous wedding adventure that awaits you. Enjoy every moment! Low key, in a beautiful setting. sounds like a breathtakingly perfect way to make your union official! there is not better way to see the beauty that is italy, that with your loved one by your side every step of the way. LOVE IT! Congratulations to you both. Have a wonderful trip. Annie, as you know I LOVE Italy. 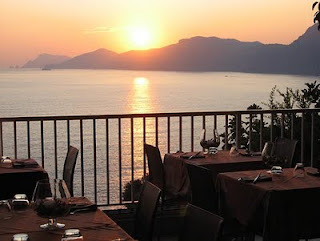 Your trip sounds wonderful & I cannot think of a more romantic & enchanting place to get married than the Amalfi coast. Enjoy every single romantic, been maried is the best moment for everyone who really wish like you guys.